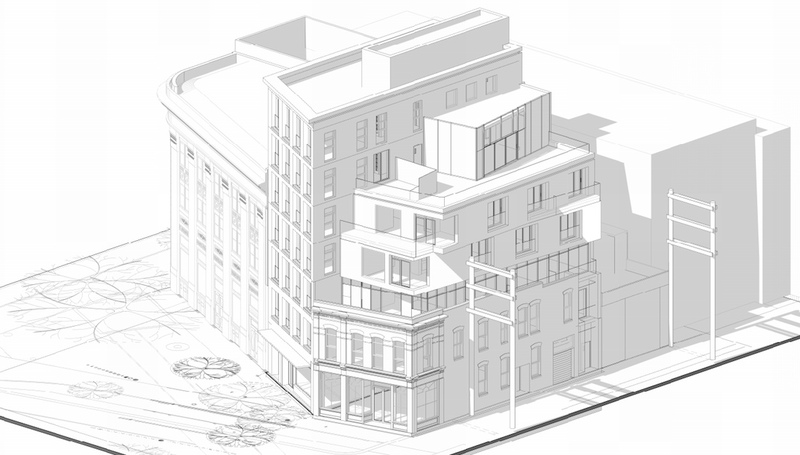 A mixed-use redevelopment involving the restoration of a municipally-designated heritage building is proposed for a site adjacent to Pigeon Park in Gastown. 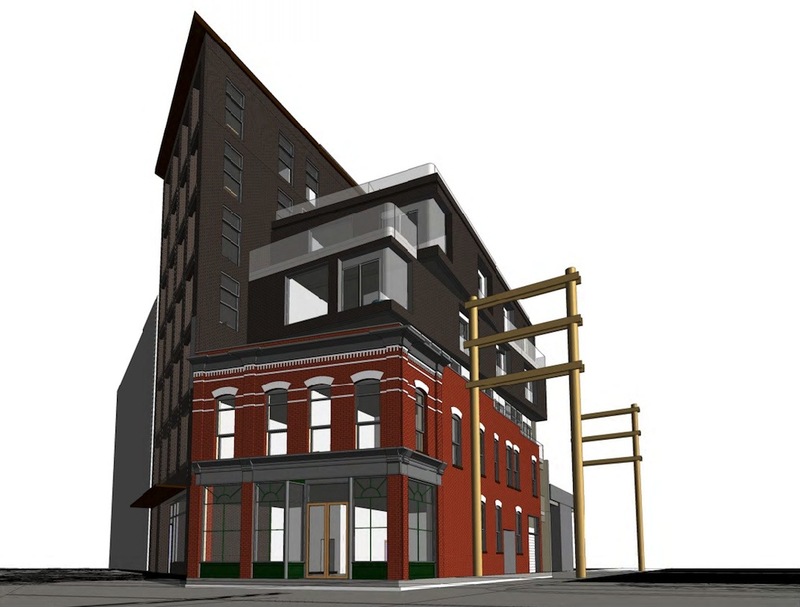 Human Studio Architecture + Urban Design has submitted a development application to the City of Vancouver to restore the two-storey McConnell Block building at 325 Carrall Street – near the northwest corner of the intersection of Carrall Street and East Hastings Street. 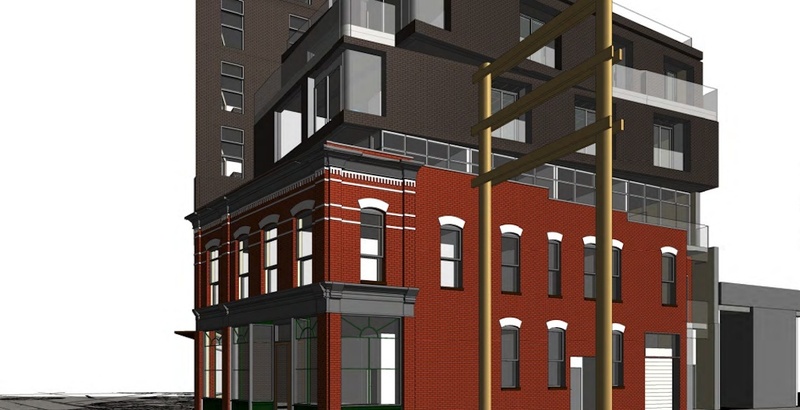 There will also be a three-storey addition on top of the existing 1889-completed building and a new 81-ft-tall, seven-storey infill building on a vacant lot immediately south. 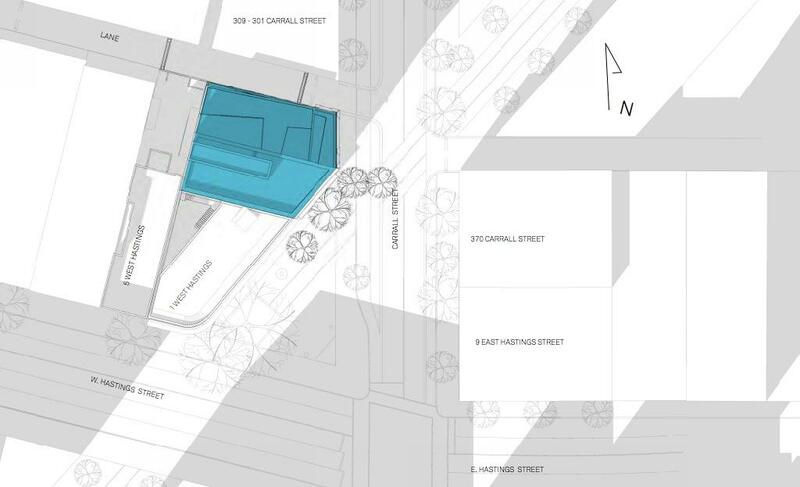 The proposal calls for 38 secure market rental homes, including 13 micro units, 23 studio units, a single one-bedroom unit, and one live-work unit. The size of the micro units range between 250 sq. ft. and 319 sq. ft.
Additionally, the redevelopment includes a 1,200-sq-ft residential amenity space and a 1,767-sq-ft, ground-level retail space. 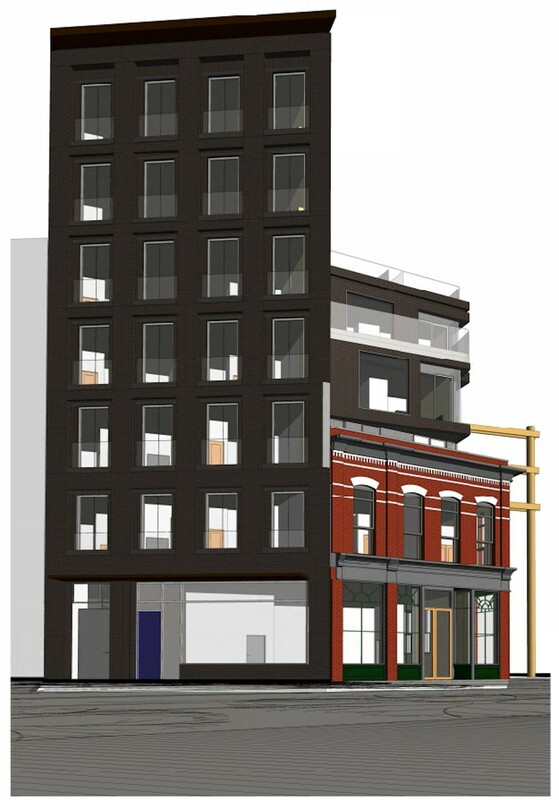 The McConnell Block was damaged by the restoration of the 1 West Hastings Street project, as cracks in the existing building were discovered, which led to the interim measure of shoring of the facade of the McConnell. “Over the years, the original composition of the McConnell Block primary facade has been slowly degraded through ad hoc renovations. The current state of the facade has lost all reference to the historic storefront at grade,” reads the architect’s design rationale. The project has a total floor area of 25,300 sq. ft., giving it a floor space ratio density of about 5.8 times the size of its lot. No vehicle parking stalls are proposed. The McConnell Block was originally occupied by the Vancouver Drug Company and the Vancouver Tea and Coffee Company. It later became the Louvre Saloon, and then the Louvre Hotel.